Summer is right around the corner and that probably means you’re already on the lookout for a getaway to enjoy the warm weather. Barcelona is the ideal destination for a perfect vacation that combines history, art, food and of course a gorgeous beach. Renting a stylish apartment with Sweet Inn is one of the best decisions you can make for the upcoming hot season. 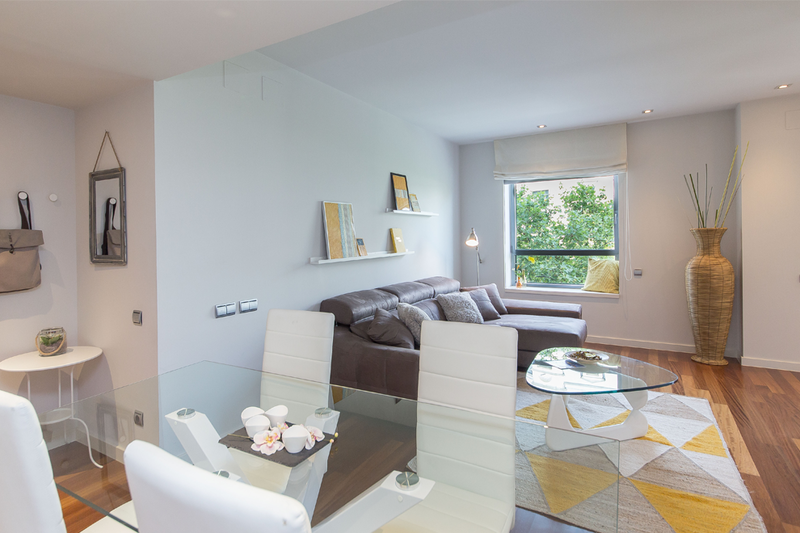 Our apartments in Barcelona are located in the most happening parts of town and come with premium amenities, the finest beds & linens and tons of other perks; you’ll notice the difference immediately when you walk in. We’re glad to present Paseo de Gracia, a 1-bedroom apartment in the heart of Barcelona, a perfect fit for solo travelers or an adventurous couple. Tranquil and inviting, this apartment is located along the chic pedestrian streets of Barcelona’s city center. The vibrant Plaza Catalunya is only steps away, and many cafes and boutiques right outside your doorstep. Next door is El Corte Ingles, a massive, trendy department store. A pleasant five-minute stroll will bring you to Gaudi’s architectural masterpiece, Casa Batllo. Bus and subway stops are around the corner; as we said, ideal location. Our local interior designers have created a cozy, cheerful space full of texture and color. They found inspiration from the prime location of the apartment, right in the middle of all the big fashion brand stores and created a trendy, elegant space; the hardwood floors add a taste of sophistication. Glass tables, large gray sofa and yellow uncomplicated decorations create a feeling of Spanish glamour. The kitchen combines black & white colors with stainless steel appliances that would make you want to cook in style. The bedroom brings a bit of a yellow color to brighten up your mornings when you wake up and the black & white bathroom will bring a sense of elegance to your showers. While looking at photos can get you excited, we have a better way for you to really feel how would it be to live and vacation in this gorgeous apartment. Click the link for the 360 experience: live tour! We have a dedicated local team in every city to make your stay completely hassle-free. We’ll personally check you into the apartment, help you get to know the neighborhood and assist you with any need you might have during your stay. Don’t you worry ‘bout a thing – we’ll take care of you. Book your stay in Paseo de Gracia today.